Juan Bautista Luis Augurio Perera (c.1822 – after 1889), known as Augurio Perera, was a Spanish-born merchant and sportsman based in England, credited alongside his friend Major Harry Gem as the earliest inventor of the game of lawn tennis. 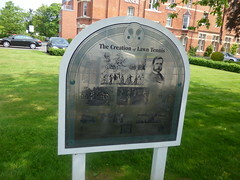 The Creation of Lawn Tennis Lawn Tennis was invented in Leamington in 1872 by Major Harry Gem, a Birmingham solicitor and sportsman, who created a game similar to racquets which did not require an expensive indoor court and could be played outside. 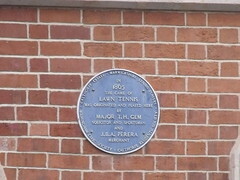 He played it first with his friend, Auguirio Perera, on the lawns of the Manor House Hotel where they formed the Leamington Lawn Tennis Club on the site now occupied by the apartment block you can see to the left of the hotel. Leamington Lawn Tennis and Squash Club is now located on Guys Cliffe Avenue.